Secure longer life and continuous efficiency for hearing aids. 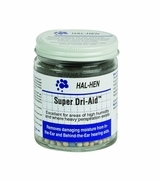 Both the Hal Hen Super Dri Aid and Hal Hen Mini Super Dri Aid protect all types of hearing aids from moisture. Before retiring for the evening, place hearing aid inside jar on top of foam pad and close cover securely. Pellets start working immediately to remove harmful moisture from hearing aid. Remove aid next day when ready to use. Hal Hen Mini Super Dri Aid is the most effective desiccant available. Utilizing special molecular sieve pellets which are physically and chemically different from silica gel based products, Hal Hen Mini Super Dri Aid pellets have an enormous capacity to hold moisture and based upon regional moisture conditions, can last for months before requiring rejuvenation. Special blue indicator pellets turn opaque to let you know when rejuvenation is required. 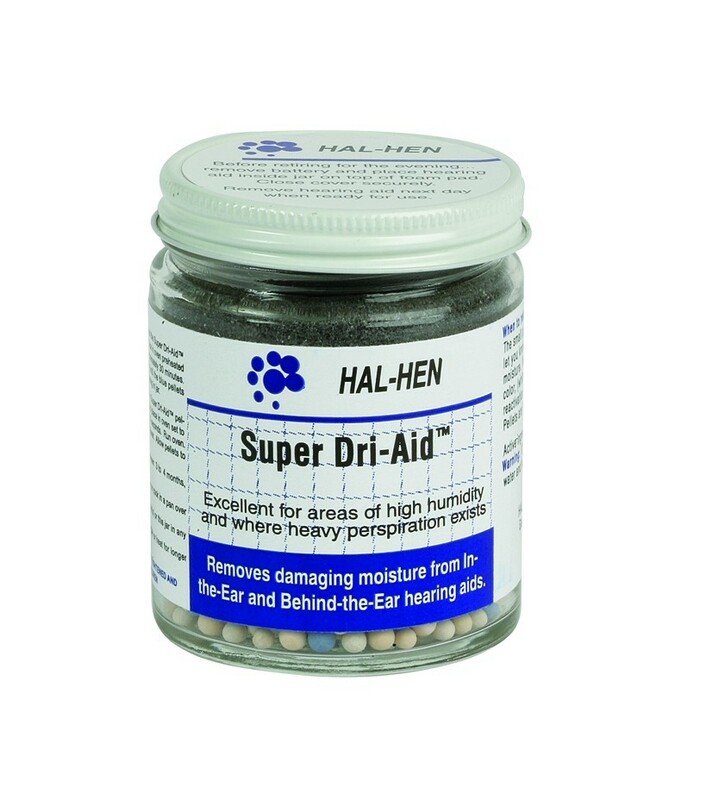 Hal Hen Mini Super Dri Aid can be rejuvenated many times and will give you years of service. Hal Hen Mini Super Dri Aid is very useful in keeping testing molds and tips free from moisture as well as removing moisture from canal and ITE instruments. The compact size of the Hal Hen Mini Super Dri Aid makes it ideal for traveling. Save 20% when you buy an entire case for $99.99. There are 8 kits per case. The price of each kit will be $12.50. That's a savings of $3/kit!! !